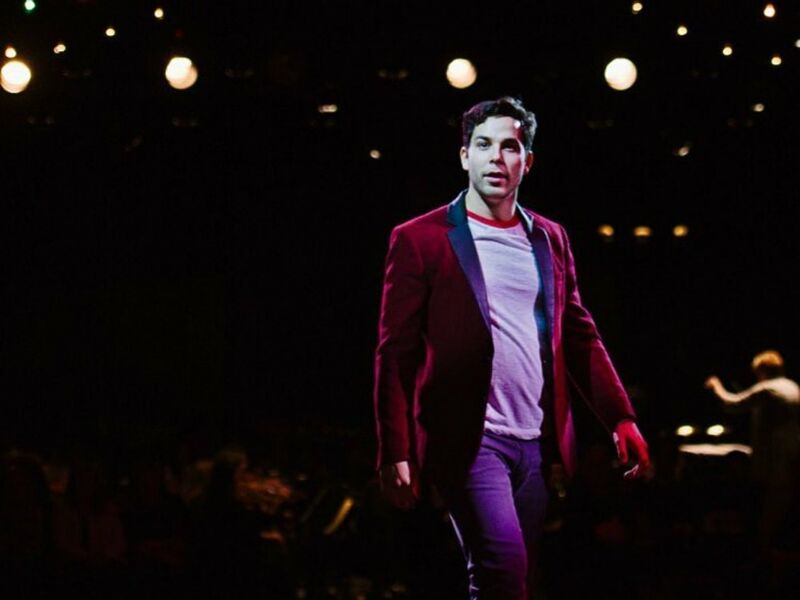 Pitch Perfect’s Skylar Astin will be at the Kennedy Center starring in a short engagement of How to Succeed in Business Without Really Trying from June 6 through June 10. He chatted with us about the revamped production made for modern times, his co-stars, his marriage to fellow actor Anna Camp, and heading to D.C. for the first time. Astin, seen above playing Tony in a NYC production of West Side Story, visits the Capitol for a limited-run showing of How to Succeed in Business Without Really Trying at the Kennedy Center. What drew you to this production of How to Succeed…? SKYLAR ASTIN: We’re rehearsing in New York as a lot of people are New York-based. We head out in a couple days, about four days before we open. Then we open, and then we close. We’re on this fast-speeding train right now. I’ve always loved the show and when I revisited it, I wanted to make sure that we were going to do due diligence to 2018 with what’s happening now with sexual harassment and how we’re dealing with that. When I spoke to the director Marc Bruni, he had the exact same thought I did, to make sure the female characters had such agency and certain numbers we would repurpose. There was actually a song that we replaced the way the 1994 revival did. Instead of doing a song that might have worked in the ‘60s called “Cinderella Darling,” we’re now doing a really cool reprise of the opening number with all the girls talking about their own ambitions. Also, I don’t know if I can say who but we also have a female Book Voice. The famous Walter Cronkhite has done it, and in the most recent revival it was Anderson Cooper, but our voiceover will be a woman and a really cool woman too. Have you worked with any of your co-stars before? Are you excited to be working alongside Waitress’ Betsy Wolfe? What’s your chemistry like? SA: Betsy is such a talent. She’s been so great to work with and has been bringing such a fun element to Rosemary. I’ve worked with John Michael Higgins before on the Pitch Perfect movies. I’ve also known Becki Newton and Michael Urie for a couple of years. It’s my first time working with them but the whole cast is bringing a lot to it. We only have two weeks to rehearse and normally we have five. They made sure to cast a bunch of thoroughbreds to really get this thing on its feet because we’re singing, we’re dancing, we’re acting and we are performing. What’s your favorite scene to perform in How to Succeed…? SA: I really enjoy “Grand Old Ivy” with John Michael Higgins. In that song my character isn’t supposed to know any of the lyrics or movements. It’s fun to play to the nuances and the reality of being involved in a song that you don’t know. It’s always a fun song to sing. Have you performed at the Kennedy Center before? Do you find it exhilarating or a bit intimidating to be in such a historical place? SA: I’ve actually never been to the Kennedy Center and I’ve never been to D.C. I’m so excited. So many family and friends have told me it’s such an amazing place. I’m so excited to get there. Since you haven’t visited D.C. yet, what are you most looking forward to seeing or where are you most looking forward to eating? SA: I want to touch down first and do my own exploring. Everyone’s got their museum, their gallery or their art they’ve been pushing on me. I feel like there’s not a part of Washington, D.C. that’s not full of history and brain food. You were in the original Spring Awakening cast. Were you excited to see it brought to light again with the NBC show Rise? SA: Between Rise and the most recent revival directed by Michael Arden, I’m so happy that the story continues to get told. A bunch of the students that were unfortunately tragically involved in the Parkland shooting, they actually put up a community production and almost the entire original cast who could make it went down and talked to them. We talked about the show and what they’d been through. We really just wanted to be there and listen to them. It’s really touching and a really beautiful show. Thank gosh for theater because these stories get to live on forever. I just ran into Steven Sater recently and he told me that Duncan and he wrote a brand-new song. I actually listened to it and it’s wonderful. You seem to be so happy with your wife, fellow actor Anna Camp (Pitch Perfect, True Blood). D.C. is full of many overworked couples who often don’t get to see each other much. What’s your advice on keeping that spark alive? SA: Have a solid foundation and really understand each other. That goes such a long way. Outside of it, there’s affirmative action. You have to make sure you’re constantly taking care of the other person, checking in with them, sending flowers. You have to turn ordinary things into something that feels extraordinary. You’ve got to be in love first to stay in love, which we have no problem with. Keep that spark going—marriage and relationships are living, breathing things you have to tend to. Gosh, that sounds corny but it’s true. SA: I have a couple films in the can, but they’re just getting edited now. They don’t have any proper releases and who knows if the titles will change. Something that is out now on Netflix and will cycle more episodes through the years is Trolls, the original series. If you have kids or just have great comic sensibility and like cartoons, it’s great. It’s just delightful. I love when something’s funny and has a great message that kids can learn from. We’re kind of Inception-ing kids through giggles.